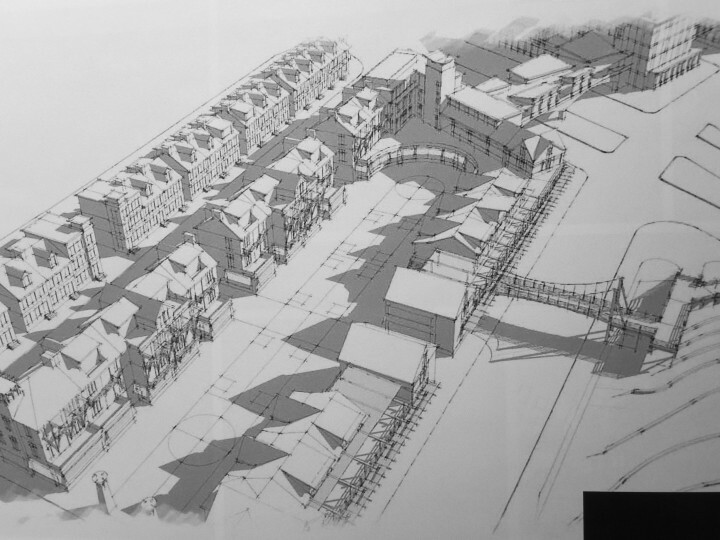 Here are some images from the Carpionato Group’s proposal to redevelop most of the vacant Route 195 land east of the Providence River, in Fox Point. The illustrations, drawn under the direction of architect Neil Middleton of TRO Jung Brannen of Boston, are quite lovely, and raise the ante for projects that, I hope, will be brought to the I-195 Redevelopment District Commission this spring. This proposal has a definite traditional feel to it, but one must not be fooled by pretty pictures. If the commission accepts this proposal in its First Level of design review, it will be tweaked in the Second Level according to what the commission, its consultants, the public (through hearings) and Carpionato Group itself feel is necessary to make the project contribute to the goals of the commission, and to emerge as a project that can be successful for both the company and the city. Over lunch on Saturday officials of the company assured me that the proposal is still on the table. My hope is that the commission can raise its sights sufficiently to move this proposal forward. And my hope also is that Fred Carpionato, who is the head of the Carpionato Group, will also raise his company’s standards to the level of those implicit in the images that accompany its proposal. And, of course, it goes without saying that the approval of an excellent proposal is not the finishing point. All eyes must focus on preventing the high quality of a proposal from being diluted in the process of construction itself. In my column last week I was tough on the commission and its standards as reflected in its Developer’s Toolkit, but that is because I believe the commissioners have enough good sense among them to realize that second best isn’t good enough for Providence. Let’s hope they will accept this Carpionato proposal – and make sure it is built according to the high standards that are professed in the illustrations above and below. 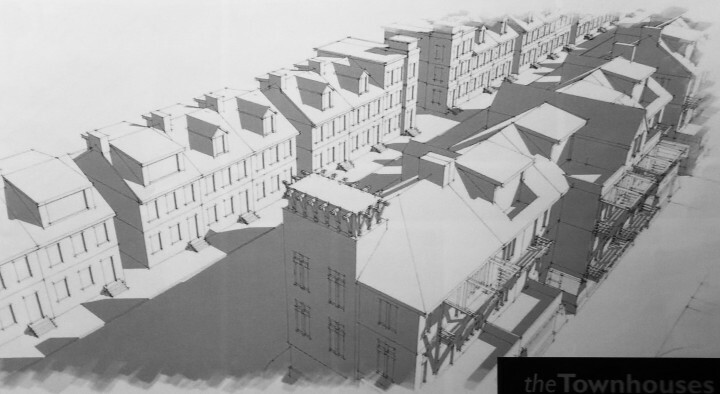 This entry was posted in Architecture, Art and design, Providence, Urbanism and planning and tagged Architecture Here and There, Carpionato Group, City, David Brussat, Development, I-195 Redevelopment District Commission, Providence RI, Rhode Island, Route 195 Commission, Urbanism. Bookmark the permalink. Last I heard the 195 commission sold a small parcel on the border of this large project to another bidder. The commish invited Carpionato to resubmit a plan with the small parcel excluded from the site plan. That’s where it stands now. But do the “high standards” you call for include being other than an open-air mall? That’s not good enough, or it shouldn’t be in Providence. In a suburb, maybe. I see signs that the public side isn’t respected. 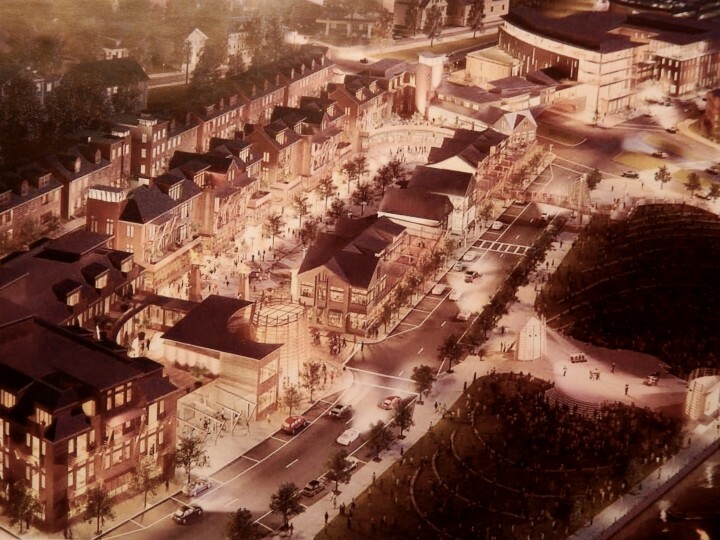 In the nighttime rendering, the nearest building on the left doesn’t look like it has doors to the sidewalk. The sidewalk isn’t continuous across the parkway at grid 3-7 to 3-5. Yet there’s a pedestrian bridge behind it. I think the bar has to be raised above traditional building forms to include traditional urbanism. It would probably be much better and less expensive if the block were simple and ordinary: a promenade-like sidewalk along South Water and then shops on both sides of South Main. It would require far less bravado, which might deflate an ego or two, but it could provide much better continuity with those two streets and with the Wickenden/Point bridge. The streets would have to be tamed, made “complete,” but that should be easy. The block looks like it’s 250 feet thick, which makes it expensive to have four layers of frontages: 2 outside and 2 inside. The buildings must be about 70 feet thick, which implies that the vast majority of the shops will turn their backs on the outside streets — or require a great deal of arm-twisting to get shopkeepers and restaurateurs to open doors on opposite sides. I agree with Bill Dennis on your blog. Bruce, I don’t doubt you and Bill are right about all of this, but I am trying to lift up the commission’s standards. As the process move along there will be time to get more detailed in criticism of the plan. A pedestrian bridge? Located where a bridge was torn down? And what’s with the wanky roof shapes? Do not confuse the pedestrian bridge (actually two) in the Carpionato proposal with the pedestrian bridge expected to be built to replace the vehicular Route 195 bridge that was torn down and rebuilt (much more elegantly) downriver. That proposed pedestrian bridge is indeed a modernist wanker (and hopefully won’t be built as planned). As for the “wanky” shapes on the Carpionato bridge, I think they come off that way because of the ilustrator’s imperfect rendering of a sort of lean-to roofs that might cover small sheds or carts, as on the Ponte Vecchio. But you are right, and they are the least elegantly rendered aspect of the plan, even including its minor modernist elements. No confusion – there was a bridge (highway overpass) over Wickenden that created a dark tunnel on the street and blocked the view up and down the street. To put one back in seems insane, especially since it will pull pedestrian activity from the street. The one that spans South Water street seems even more ridiculous – would people really go up one level, cross the bridge, and then go down a level? I do think the ‘grain’ of the project is good, but I think there are some missed opportunities for useful and memorable public space that is not internalized. Bill, you are right about the old 195 overpass over Wickenden/Point Street. And you may be right about certain opportunities missed in this project. I hope these will be addressed in the review process, if the proposal gets that far. So far as I understand it, Bruce, the public is invited into this private development. 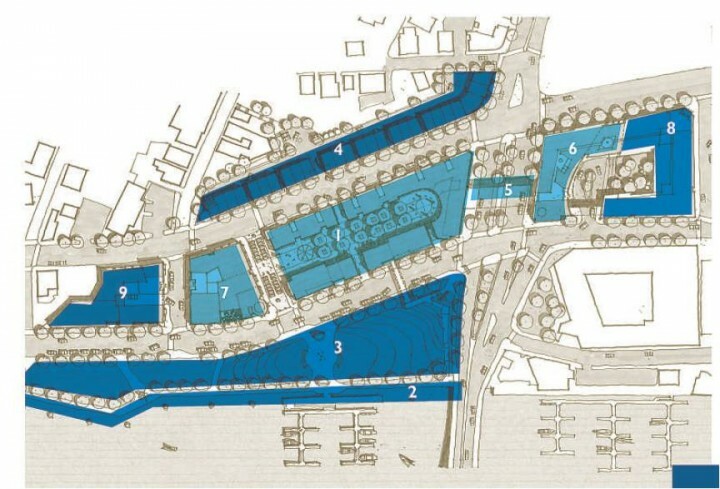 And it has at least two public streets running through it, possibly three and maybe more (though I gather they want to remove one of them, South Water Street, so that the public space/park portion of the development can run down to the Providence River without having to cross a street. I will add a plan to the illustrations in the post. Maybe that will help. Yes, another introverted development. Private bridges and an internally oriented pseudo main street. I guess the public realm is icky or something.